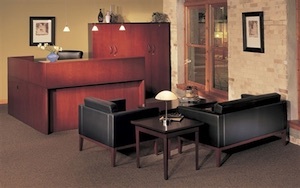 This modern veneer reception area furniture features elegant lines with excellent durability. Available in two rich finishes. This office furniture features AA-grade select North American hardwood veneers. All veneer surfaces are protected with two coats of high-tech catalyzed lacquer. This Corsica veneer reception station offers a sophisticated, classic appearance for any business entrance. The Corsica Series will complement a contemporary or traditional setting. To complement your reception desks, we offer many choices of lobby chairs, small tables, and sofas. Reception area furniture is highly visible and it must be durable. If you choose the right reception area furniture it can make the image of your business long lasting. You get only ONE opportunity to make a first impression to your customers - with the VQV Furniture Group you can make it positive and save time and money in the process! Our office furniture specialists will help you choose the right reception office furniture to fit your company's needs, as well as your budget.